Definition: Legislation and regulations and guidelines for conditions of employment, work standards, and development of the health workforce. Employment law and rules for civil service and other employers. Appropriate scopes of practice defined for all cadres. Gender: Missing Dimension in Human Resource Policy and Planning for Health Reforms. Hilary Standing, 2000. Guidelines for Human Resources for Health Policy and Plan Development at Country Level (Draft). World Health Organization, Regional Office for Africa, 2004. Health Workforce Planning Workbook. Centre for Public Health, University of New South Wales, 2001. Tools for Planning and Developing Human Resources for HIV/AIDS and Other Health Services. Management Sciences for Health (MSH), 2006. Achieving the Right Balance: The Role of Policy-Making Processes in Managing Human Resources for Health Problems. Department of Organization of Health Services Delivery, World Health Organization, 2000. 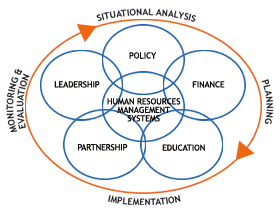 An Overview of Human Resources for Health (HRH) Projection Models. The Capacity Project, 2008. Health Workforce Innovations: A Synthesis of Four Promising Practices. Health Workforce Innovations: A Synthesis of Four Promising Practices. The Capacity Project, 2007. Human Resources for Health Planning and Management in the Eastern Mediterranean Region: Facts, Gaps and Forward Thinking for Research and Policy. Human Resources for Health, 2007. Human Resources for Health Programs for Countries in Conflict and Post-Conflict Situations. The Capacity Project, 2006. Workplace Violence Policy. Penn Behavioral Health Corporate Services. Penn Behavioral Health Corporate Services, 2008.